This week it happened. And the name of the fiber was Ingeo! I thought I was ready. I'd tackled silk and done okay. But no, this one got me but good. I asked my FT friends for advice and Angela suggested spinning it from the fold. This probably would have helped if I was proficient in the technique, I tried it with silk and made quite the mess. Joanne said to try drafting from the other end of the roving. A very good tip as it turns out that Ingeo is a directional fiber and will draft more smoothly from one end than the other. Lisa advised me to give it lots of twist. So, I did. 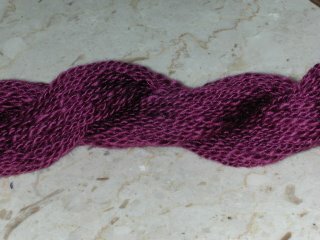 After numerous tries I finally was able to make an entire skein. It's not a good skein or a pretty skein, but it's a skein. I found I had to be sure to use a backward moving draft rather than the way I oftentimes spin Merino by pulling some of the fibers forward. Doing that with Ingeo made lots of little bumps. The resulting yarn doesn't even feel nice--sorta like Red Heart and measured in at 11 WPI. The frustration from the Ingeo experiment is clearly evident in the other skein I spun last week. 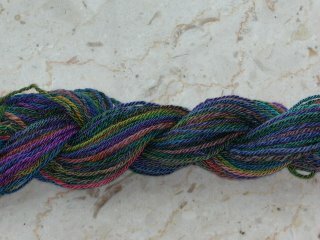 A Navajo plyed skein from the Blue Moon Merino. The singles were severely overspun as I tried to treadle away my exasperation. But, to get longer lengths of color, I was spinning back and forth across the top, which I'm not very good at either. I much prefer to strip a painted roving down to thinner strips (I know this is a big no no with some people). I thought I'd like this skein more than I do. The colors look muddy because I had trouble keeping them separated when spinning across the top. It seemed like the fibers from the next color down kept getting pulled into the drafting zone when I didn't want them to. Even without the overtwisting problem, the colors just don't sing to me. Lastly, I want to thank everyone for their comments these last few weeks. I wish I was able to write everyone privately to thank them. It really means alot to me when you stop by and leave a comment. And, encourages me to keep up with writing these posts every week. I think you are way too hard on yourself. They both look lovely!! your skeins look wonderful to me! I agree with Elizabeth! Both skeins look pretty awesome from this computer! I can't get the fold thing or the top of the roving thing either, and I do what you do, pull the roving into smaller sections - why is it a no, no?? Both skeins look great, but then I didn't have to suffer through spinning the ingeo. I asked an experienced spinner about it once and all she said was "don't go there", and I didn't. The colour is so nice in your skein. I like the colours in the Navajo plyed skein too. OK, so what's the problem? Both skeins look great to me! I had some beautiful blue ingeo Sam gave me, but I tried spinning it and it made me nuts. I destashed it. I hope it has a home now. I agree with the mob, things look pretty good. Have you tried knitting with the Blue Moon stuff? It might be something you really like when it's knit up. I think the color sep came up well. 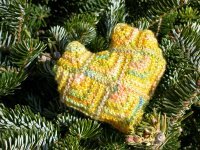 Maybe as fairisle against a navy background? Thank goodness, we can count on you, Vicki, to stretch your skills even further . .. and challenge us to do the same. Well, in the words of Martha Stewart--mediocrity is nothing to strive for.